Music connecting people and pulling them apart again. Music is a type of magnetism, it pulls people towards particular dipoles and away from others. it can also anchor you in place hold you rooted to the spot. Maybe the spot where you first kissed your lover, the corner of a street where you said unkind things to one another on the way home, after a long day. The damp cold living room where you warmed each other after being caught in a snow storm, your faces lit by the LED of the cheap MP3 player you bought in the January sales, as you share the headphones beneath a blanket. The first time you saw your ex holding hands with someone else in the corner of the pub as the jukebox blares out Radiohead. These things collect up. My CD racks (yes I still have those, and shelf of vinyl too, reprehensible hipster that I am), they resemble photo albums with music as a memory storage device. Some liner notes scrawled in a CD cover given to you by an ex. The look she gave you the first time you hand her one of these things. So it goes. And the sound track to the end of the relationship is the sound of the needle in the groove at the end of the record as it crackles ceaselessly. Well that’s what I’m talking about anyway, when I talk about mix tapes. Hello! Happy Monday dear Whimsybombers. I have received word that a CD has been left at the Center On Halstead in Chicago. Did you find it? What did it mean to you? In other news I think I’m going to start a Monday Morning Tape in honour of Chicago’s most famous (fictional) record store. Also Whimsybomb might do a regular podcast too. 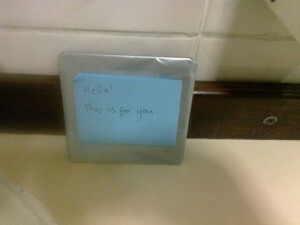 The above was left in the Stag pub in Sheffield (United Kingdom). Did you find it? What did the letter say? We’d love to hear from you. Heck, we’d love to hear from you even if you didn’t find a CD. Get in touch with us. Today one of our readers emailed us to say that they left three mix CDs in motorway service stations in the British Midlands. One of which was located in Knutsford services. Please let us know if you picked it up, we’d love to hear from you. I happened to be thinking earlier that this would be a good way to introduce and publicise unsigned bands (with their permission of course). If bands were willing to donate a track a month then WhimsyBomb could host that track as a free download which people could then put on their compilation cds before distributing them. Everyone wins! The bands get free publicity, we get to distribute music without any breach of copyright and the receivers of the cd get to hear some new music. What say you people? Does anyone know of unsigned bands that would like to get involved with us? 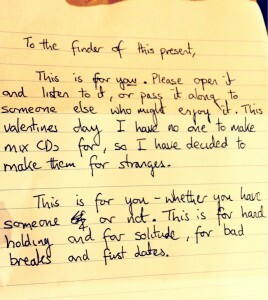 The above is the first letter that I left attached to a CD. It was placed in Brew on Bold Street in Liverpool. I included my Twitter handle so that I could see if anyone picked it up. They did and got in touch. 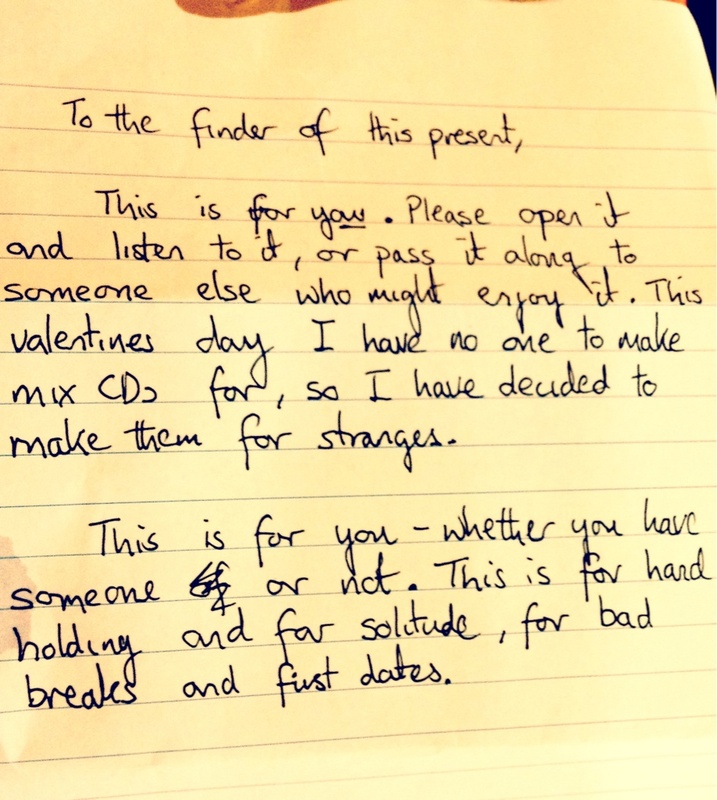 On Valentines day 2012, David Weaver had the idea to make mix CDs and plant them around the city he lived in, for people to find. With the help of friends, they were placed them in cafes, on buses, next to sinks in public toilets and anywhere else we could think of. We attached notes explaining that he was doing this as he had no-one else to make a mix CD for so he was going to do it for strangers. Some of the notes had links to a twitter account, some were anonymous. Sometimes we would sit at a table nearby and watch people’s reactions when they found the CD. 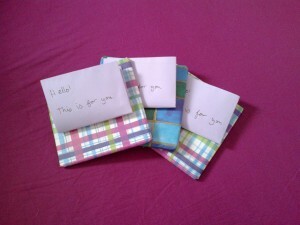 Reactions ranged from bemusement and confusion, to “Oh wow, who left that there?” – All in all it was a great evening. We’ve started this website to encourage others to do likewise. Please make a CD or a gift and wrap it with a note attached for a stranger to find and send us a photo of the location you have left it. Please mention this site in the note. You can choose to remain anonymous or not. We will upload the photo to this blog and see if anyone gets in touch. Let’s start a chain of unexpected giving.